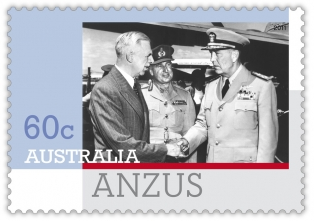 Released in Canberra yesterday (16 November) this stamp shows the military representatives of the ANZUS countries gathered in Honolulu for the first meeting in 1952: Lieutenant General SF (Sydney) Rowell (left), Australian Chief of General Staff, is greeted on his arrival at the airfield by Admiral Arthur Radford, US Commander in Chief Pacific (right), and Major-General Gentry, New Zealand Chief of General Staff. Unfortuantely, it is very concerning that Australia Post writes that the stamp has been released to celebrate the visit of US President Barack Obama, and breaks Australia Post's Stamp Policy. At last Australia Post has put its Impressions range online (see http://shop.auspost.com.au/stamps/impressions-2011). Lots of interesting (and expensive!) items, and the first time we've seen the AFL mini-maxi cards on sale.